NAPA, Calif.--(BUSINESS WIRE)--BottleRock Napa Valley 2019, presented by JaM Cellars, announces its seventh annual festival lineup today, which includes headline artists Mumford & Sons, Imagine Dragons, Neil Young + Promise of the Real, Pharrell Williams, Santana and Logic. The three-day music, wine, food and craft brew festival will take place in the heart of the City of Napa at the Napa Valley Expo, May 24 - 26, 2019. 3-day festival passes go on sale at 10AM PST on Tuesday, January 8, 2019 at BottleRockNapaValley.com. Single-day passes will go on sale at 10AM PST on Thursday, January 10, 2019. BottleRock Napa Valley also presents its legendary Williams-Sonoma Culinary Stage, showcasing a unique mashup of cooking demonstrations with renowned chefs, celebrities, performers and rock stars. Details on the 2019 culinary stage will be announced at a later date. ***Note to Editors: The proper spelling of “BottleRock” is as such with a capital “B” and “R,” all one word. ***Media Contact: Please email media@bottlerocknapa.com with questions. ***Media Credential Requests: Please email mediacredentials@bottlerocknapa.com. BottleRock Napa Valley features the world’s top musicians on five music stages plus the VIP Acoustic stage, along with the infamous BottleRock Culinary Stage showcasing one-of-a-kind culinary and celebrity mashups. Master Sommeliers, celebrity chefs and dozens of the region’s finest vintners, restaurateurs and brewers rub shoulders with guests in an intimate setting. BottleRock Napa Valley offers the best in wine, food and craft brews to complement the music and create an authentic wine country experience for festival guests. To keep up to date on festival pass availability and additional details about the festival, please visit www.bottlerocknapavalley.com and sign up to receive email notifications. Join the conversation on Facebook and follow us on Twitter (@BottleRockNapa, #BottleRock) and Instagram (@BottleRockNapa, #BottleRock). BottleRock Presents produces premium events featuring live music, food and wine throughout California including BottleRock Napa Valley. JaM Cellars is all about easy-to-love, everyday wines. Crafted by Napa Valley vintners John and Michele Truchard (the “J” and “M” in JaM), Butter Chardonnay, California Candy Dry Rosé, JaM Cabernet Sauvignon and Toast Sparkling are rich, bold, luscious, and live up to their names. Butter Chardonnay melts in your mouth, California Candy leaves you wanting more, JaM Cabernet brims with berries, and Toast Sparkling is a celebration in a glass. These wines are made for sharing with friends anytime—whether it’s a special occasion or everyday celebration, and whether you’re at BottleRock Napa Valley presented by JaM Cellars, the JaM Cellars Ballroom, the JaM Cellars wine and music studio in downtown Napa, or enjoying from the comfort of home. Check out JaM Cellars on Facebook and Instagram @JaMCellars #JaMCellars and JaMCellars.com. 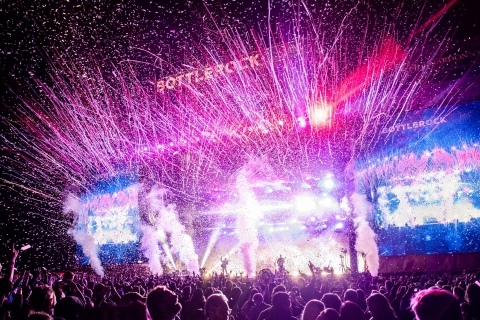 BottleRock Napa Valley 2019, the three-day music, wine, food and craft brew festival, will take place in Napa Valley May 24 - 26, 2019.